(What If? II#75) - When the newly-formed Generation X battled the Phalanx known as Harvest, Blink used her mutant powers to disrupt time and space, nearly blinking herself out of existence. Banshee managed to grab her hand, keeping her from blinking out of existence, but instead blinking Harvest, M, Synch, the White Queen, Sabretooth, Husk, Skin, and Jubilee out of existence. When Blink managed to gain control over her blinking powers, she found that she was no longer onboard the ship battling Harvest, but instead outside of reality. She was in a world comprised of buildings from her own memories and covered in floating bubbles, filled with her own memories. Inside one of the bubbles, she saw that Banshee was drowning in the ocean after Blink had blinked the children, Harvest, and the ship they were on out of existence. Determined to save him, she used her powers on the bubble itself, causing it to pop. 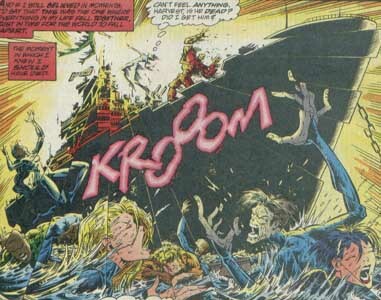 As it popped, another bubble took its place, this one containing the image of Banshee being saved by a nearby ship. Happy that she had saved Banshee, Blink continued down the road in this world, determined to find the bubble that would let her bring Generation X back, not aware of the cosmic In-Betweener watching her every move. Back at the Xavier Institute, Banshee arrived from his ordeal to find that Xavier had discovered a cure for the Legacy Virus, much to the satisfaction of Colossus and his formerly-diseased sister, Illyana. Banshee just looked at the situation confused, given that he remembered going to Illyana's funeral himself, while Blink continued to alter the memory bubbles for the better. After a while, Blink was attacked by the In-Betweener who claimed that Blink had been disrupting the balance of the timestream. Panicked, Blink used her powers against the In-Betweener, apparently destroying him. Banshee, on the other hand, remained confused as things in his reality kept altering. He soon saw Professor X walking again thanks to the magnetic implants that Magneto had designed for him, and he also realized that he and Moira MacTaggart were married with children. When the Beast spoke to Banshee, he asked him if it had really been three years since the X-Men had disbanded and that nowadays, all there was to do was party. Forge interrupted him, claiming that the Beast actually had his hands full restoring the Brazilian rain forests. The Beast responded that restoring the rain forests was easy, now that tensions between mutants and humans had vanished. Although still very confused, Banshee spoke with Jean Grey and Cyclops, who was now able to see thanks to ruby quartz contact lenses. He soon passed by Wolverine, who was talking about making Ethiopia fertile again, and thought to himself that it was only yesterday that he had been battling Harvest and the Phalanx. Moira MacTaggart soon joined her husband, asking what was wrong. Banshee explained that things didn't seem right and Moira suggested that they use Forge's Neuro Transmitter to share their thoughts with one another, so that she could feel what Banshee was feeling. After she discovered the reality that Banshee remembered, the X-Men's alarm went off. Banshee and Moira ran to find Storm and Forge extinguishing a fire in Cerebro. Forge explained that Cerebro had begun to pick up anomalies in the timestream, stemming back to the death of Generation X. Forge then deduced that the anomalies were isolated to a specific tachyon signature, the one given of Blink, whom he figured was still alive and somehow manipulating the time itself. Back outside of reality, Blink had managed to absorb the In-Betweener's powers and attempted to erase the deaths of others from the bubbles. As she did so, the ground itself transformed into a slimy substance and began grabbing at here. Due to her manipulations of time, multiple time anomalies began to appear in the real world, such as two Galactuses fighting each other, Human Torch battling dinosaurs, and the Red Skull restarting the Nazi Party. Banshee explained that the anomalies were being caused by Blink and that the only way to set things right was to kill her. Forge and the other X-Men protested Banshee's plan, as it would take away everything good that had happened due to her manipulating. Banshee exclaimed that there was no other alternative, but the X-Men and Moira warned that he could not go through every one of them. 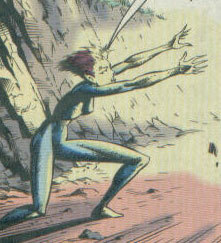 While Blink attempted to defend herself against the slimy substance, the X-Men were attacked by Sentinels and Napoleonic troops at the same time. Banshee saw their distraction as his chance to fix things and as he ran to Cerebro, time began to unravel further, with the dead rising, Wolverine battling Neanderthals, and Red Skull killing Captain America. Banshee soon found the button that would allow him access to the plane outside of reality and he hit it, transporting himself to the realm outside of reality. Banshee arrived in time to see Blink overwhelmed with the slimy substance containing various events and memories. He explained that her manipulating was destroying the world and that the only way to stop it was to die. She then allowed the substance to destroy her, which allowed to transcend her mortal body, where she was contacted by the still alive In-Betweener. With reality restored, Banshee and the other X-Men went to the funeral of the deceased Generation X members, not knowing that he was being watched by the In-Betweener and Blink, who had swore an oath of non-interference in exchange for her survival. Comments: Created by Stefan Petrucha, Greg Luzniak, and Andy Lanning. 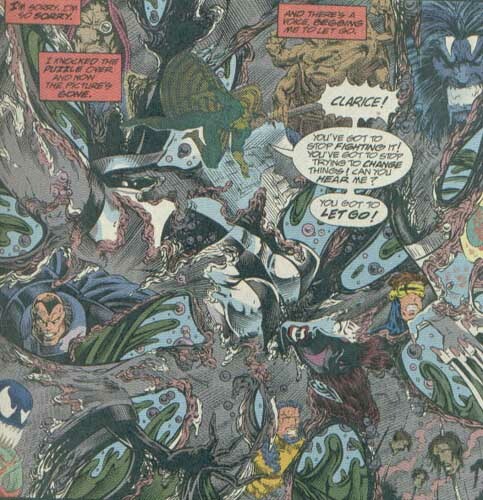 This alternate Earth diverged from the events seen in X-Men II#37 (October, 1994). When Blink used her powers against the Phalanx known as Harvest, she inadvertently killed the other members of Generation X. She eventually regained control of her powers, but found she was in a realm outside reality. She soon realized that she could manipulate the events of reality by destroying bubbles that contained events occurring in time and space. When she destroyed the bubble, a new one took its place, causing the events in reality to change for the better. While she did change a number of events for the better, her manipulation of the timestream eventually backfired as her manipulations caused anomalies in the timestream that threatened to destroy the universe. Banshee and the other X-Men discovered that she was the cause of the anomalies, and Banshee managed to travel to the realm outside reality, where he talked her into destroying herself. When she did so, she was contacted by the In-Betweener, who allowed her to survive if she swore an oath of non-interference. When Blink used her powers against Harvest, she accidentally caused her powers to affect the six members who would have comprised Generation X, killing them all. Their roster was as follows: (from left to right): M, Synch, the White Queen, Sabretooth, Husk, Skin, and Jubilee.